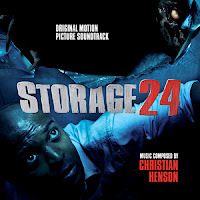 Written, produced and starring Noel Clarke, Storage 24 is a science fiction thriller where the horrific story takes off when a military plane with highly classified contents crashes in London. The mesmerizing music for the film is written by Christian Henson, the composer who won the ‘Best Musical Score’ trophy at Screamfest for Black Death (available on CD from MovieScore Media) and who has recently written the score for another sci fi feature, the award-winning Grabbers as well as features such asTriangle, Severance and The Secret of Moonacre. 5/5 I have always enjoyed "Henson" a hidden talent that knocks on the door, so answer it.